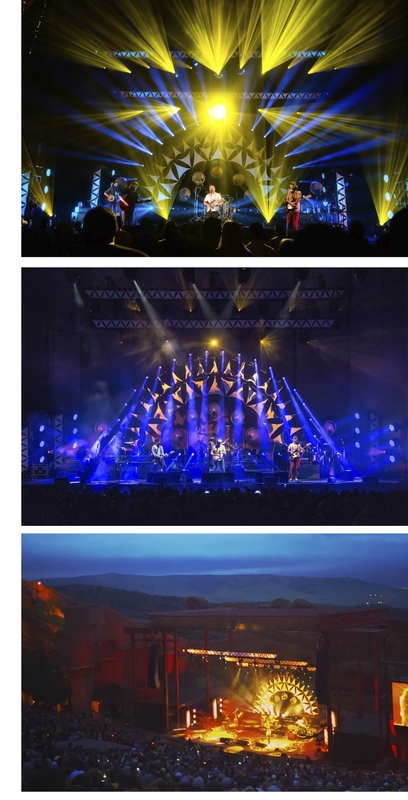 4Wall Entertainment Provides Lighting to LD Marc Janowitz for the 2018 Dispatch Tour | Press Center | 4Wall Entertainment, Inc.
Nashville, TN- This summer, veteran roots rockers Dispatch hit the road in support of their second album in two years, Location 13. 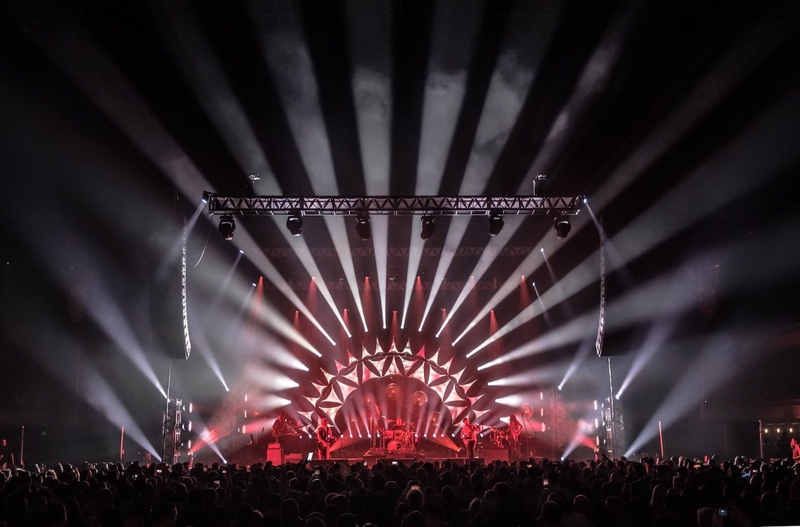 Lighting and Production Designer Marc Janowitz (E26 Design) designed the band's summer tour utilizing gear from 4Wall Entertainment. The design process for the tour started in February and was finalized in April. 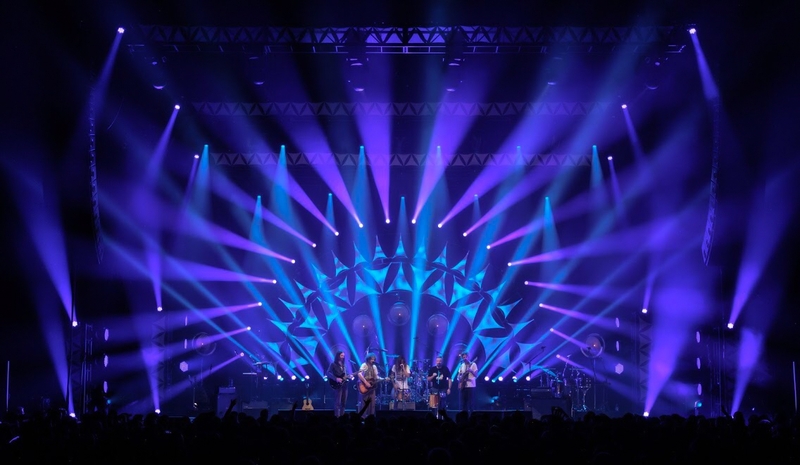 "The band wanted to achieve an impactful, unique and customized lighting and scenic look," explained Janowitz. "The visual theme of the tour is inspired by Native American tribal art. The design was meant to borrow some of that without being too literal." The rig needed to be flexible and adaptable due to the tour routing and lightweight for the many venue restrictions. "Special attention was made for a design that could still be implemented, even if slightly adapted, for the different venues and stages we faced during the tour," said the LD. "The intent and the impact had to stay intact." 4Wall provided a moving lights package of Robe Pointes, Spikies, Vari*Lite VL4000 Spots, and GLP Impression X4S LEDs. The primary function of the Pointes is to emanate light beams over and through the band from low and behind. "They do exactly what we need them to do and are awesome," said the LD. The Spikies weight and size were well suited for contour applications. "You can get a super tight beam or a wider soft beam or a prism and a moonflower effect in there if needed as well," explained Janowitz. "So you get a lot of bang for your buck out of a light that's super easy to mount in lightweight applications." The VL4000 Spots are the workhorse spot fixture for frontlight, backlight, sidelight, and create texture and gobo effects on the arc shapes. "The VL4K Spot is a very diverse fixture with its multiple gobo and animation wheels, colored gobos and framing shutters," said the LD. Most of the 30 GLP Impression X4S fixtures are used as uplights to graze the front of the stretch shapes. The rest are used to graze the truss banners and occasionally swoop down to the stage for some soft beamy aerials. 12 TMB Solaris Flares are setup for backlighting the stretch shapes and for footlights on the band. The tour's Lighting Director Chase Nichols shared programming duties with Janowitz utilizing 2 High End Systems Full Boar 4 consoles and 2 Hog 4 Playback Wings. "We made a page per song and every page has a main cue," explained Nichols. "The main cuelist may just be a starting look without any intensity or it could have over 20 cues. There are about 10 additional faders that are specifically programmed with something specific to that song's needs." The tour wrapped up last month at the sold-out Blue Hills Pavilion in Boston. Follow Marc Janowitz on Instagram or visit his website here. Follow Chase Nichols on Instagram.